There’s been lots of chat during the past month or two in the news I scan about apples deserving ‘super fruit’ status. You may remember what I think about the expensive exotic ‘superfruits’, if not, you can review Health Claims of ‘Superfruits’ - Fantasy. A large apple (about 5 ounces) with the skin (please note that it is with the skin) has an oxygen radical absorbance capacity (ORAC) of about 7500 units. Comparing it with a half cup of blueberries at about 4750 the apple would deserve to be considered a superfruit. The skin is where most of the antioxidant power is stored – so try to make recipes that don’t discard the skin. Apples are high in fiber and vitamins; and low in fat and sodium. No question that apples are a nutritionally packed yet portable snack. In addition, because of the water and fiber, apples are a great choice when trying to manage weight – they make you feel full, yet do so with few calories. Let’s not forget soluble fiber’s ability in apples to bind LDL cholesterol (bad stuff). Unlike sticky candies and cakes, apples are juicy and don’t get stuck to your teeth – great refreshing, juicy snack choice. It’s so great to get the actual numbers to backup my argument. Any of you can learn to check the nutrition facts yourself. Do not be deceived by the hype about the antioxidants in the latest exotic fruit. Here is more evidence that you don’t need to spend a fortune on exotic ‘superfruits’ to benefit from antioxidants. These muffins are another example in controlling the ‘mindless margin.’ Each muffin is 100% whole wheat, made with extra virgin olive oil, no added sugar, fresh apples – perfect for breakfast on the run, snack, or dessert at less than 100 calories. If you usually buy the 300-calorie white flour fatty muffins – you’ve saved 200 calories. Remember to redefine the 200 calories as 20 pounds in a year – I think that’s very motivating. No matter if your focus is Mediterranean-style eating, managing the ‘mindless margin’ or eating a healthy diabetic diet – you can accomplish it with these muffins. One package of Dr. Grandma's Whole Wheat Muffins Your Way (with accompanying extra virgin olive oil packet (1/4 cup). Preheat oven to 400 degrees F. Coat the standard 12-cup muffin tin with vegetable spray. Mix the Muffins Your Way flour mix packet, and cinnamon. Mix the two extra large eggs or ½ cup egg substitute, the water, the oil, and the apples. Mix the apple mixture with the flour mixture. Do not over mix. Fill the muffin tins. Sprinkle with cinnamon and sugar mixture, if desired. Bake for 16 to 20 minutes. Remove from the muffin tin. Can be frozen. 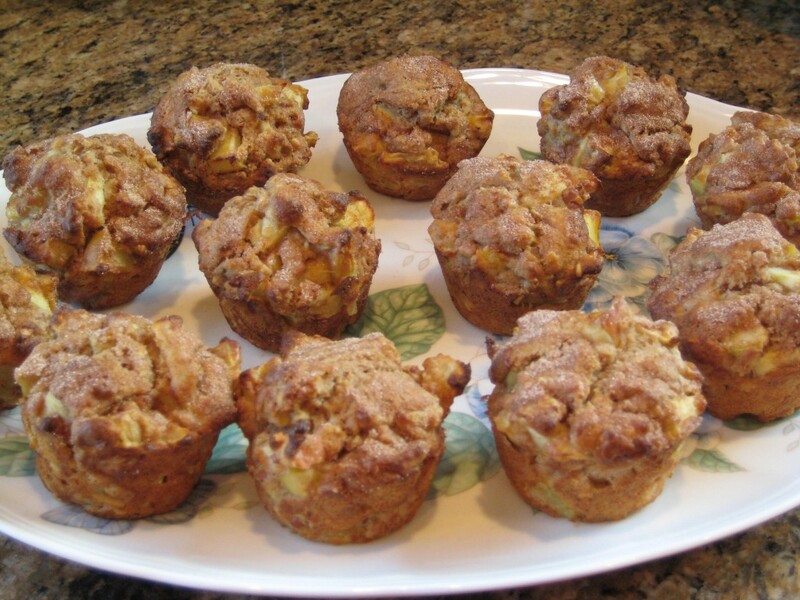 Grandchildren and children alike love Fresh Apple Muffins.